That’s when Jenny started reciting a recipe for the cucumber avocado summer salad she had found on Food52. It was perfect. I had several ripe small avocados sitting in a bowl on my kitchen table. So I just stopped off at the store and picked up an English cucumber and a couple of limes on my way home. English cucumbers have a thin enough skin so you don’t have to peel them. I chopped up the ingredients right away, and in a burst of inspiration, I added a teaspoon of dill seed. 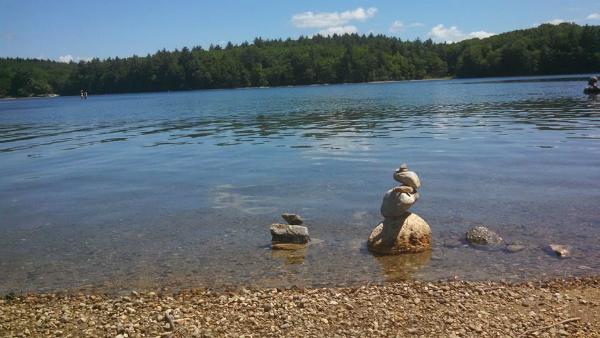 To make it a complete lunch, I toasted a whole wheat English muffin, and then shared the meal with Jenna before we zoomed off to Walden Pond to swim in a glorious late spring day. 1. 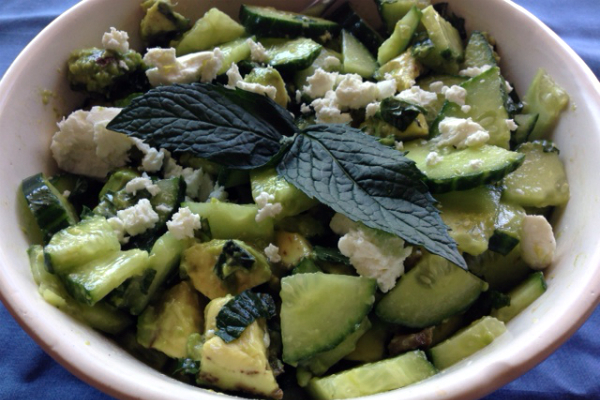 Combine the cucumber, avocado, and mint in a medium sized salad bowl. 3. Emulsify the lime juice and olive oil by whisking rapidly. Add salt. Pour over cucumber and avocado and stir gently to combine. 4. Add feta or goat cheese on top and serve. 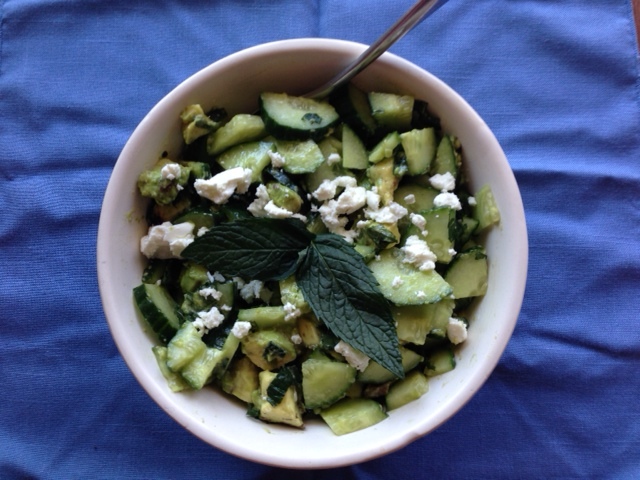 Inspired by the same bed of mint and recipe, we hurried home to make the cucumber-avocado-mint salad.I think it was a little creamier (less crunchy) than yours — maybe because I diced the cucumber smaller and used chevre instead of feta. Good summer fare. Mine was creamy, too, because of the goat cheese. But a really good light lunch before a swim in Walden!